Please join us for Basic Training on Friday, March 29th from 4:30pm - 8:15pm and Saturday, March 30 from 8:30am - 2:00pm (Dinner, snacks and lunch provided). This training is mandatory for all prospective and active altar boys. In this training Altar Boys will achieve a greater understanding of the role of an altar boy. 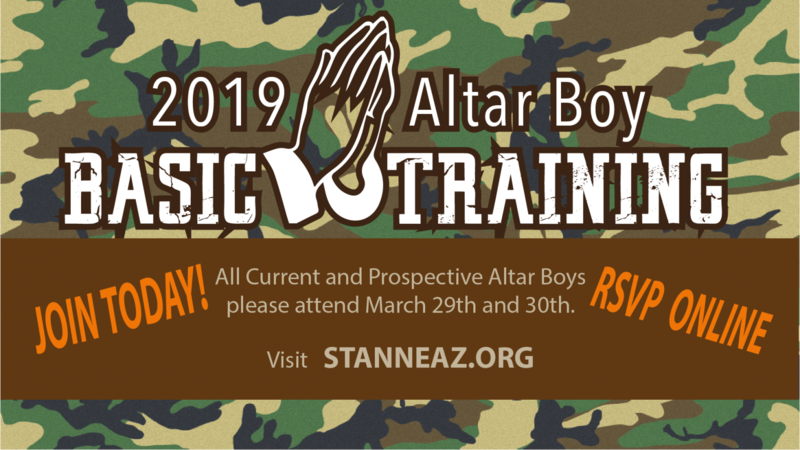 The goal of this two day training is to provide Altar Boys with the opportunity to increase their abilities in the ministry making it a more cohesive service to our Lord and fellow brothers and sisters in Christ. Come join us for some great liturgical training, fellowship and fun! We will play some dodge ball on Saturday too! Hope to see you all there. ++prospective altar boys need to be: Catholic boys and young men who have received their sacraments of initiation (Baptism, Confirmation, Eucharist) that seek to serve our Lord on the altar at the holy Liturgies!